Prepping for exams, revising, and dealing with the stress and anxiety that comes with them, is hard at the best of times. It’s even harder if you feel like you’re having to do it all on your own. Teamwork, however, can make all of the above so much easier to negotiate – but only if you are working as a team effectively. It isn’t always easy to get right, but if you do, it can lead to all involved getting better grades. Therefore, TopperQ are here with a guide to effective teamwork, with tips on how to work together well, and the benefits that can come with it. It’s important to remember that being part of a team doesn’t mean you can just switch off individually. If you aren’t pulling your weight yourself, you and those around you will suffer for it. It is important in any team that each member understands, and is comfortable with, their responsibilities. 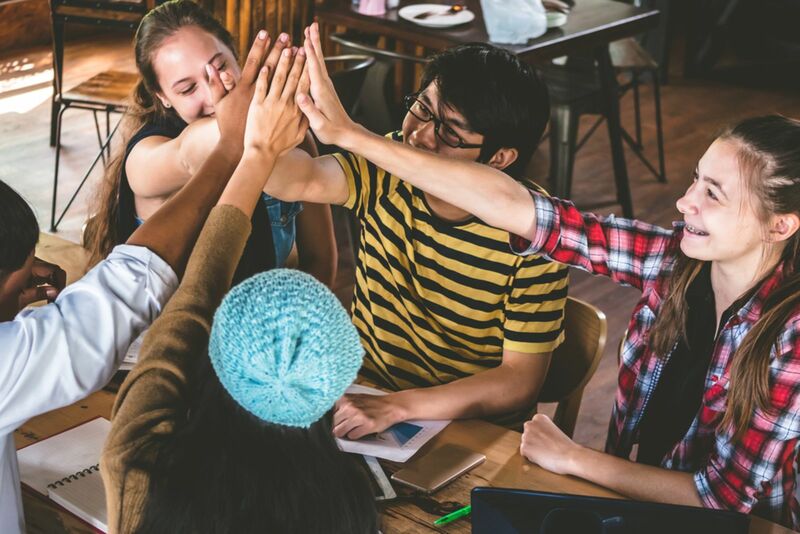 You can help your friends get better grades with teamwork by not shirking your responsibilities, and by doing the same thing, they can help you achieve better grades too. Studying as a team, and learning how to make a collaborative group function properly is a valuable life skill. In later life, being an able team member, excelling in cooperative scenarios and being able to work well for a common goal, are all valuable assets to have. These skills and characteristics can be honed and developed within the group study team dynamic. This way you can achieve both better grades with teamwork, and improved interpersonal skills, both which will prep you for the working world later in life. The people you surround yourself in your team can determine the eventual success of your group. Just as you are responsible for supporting, motivating and assisting your teammates, they are equally bound to do the same for you. Make sure you surround yourself with people who are willing to work as hard you are, for everyone, and not just themselves. Further, to get better grades with teamwork, try and get a team of people with good subject knowledge in areas that you struggle in – their fresh perspective on a topic could help you see it in a new light. If you also are strongest in areas where they themselves struggle, then you have the recipe for a perfect, cooperative team dynamic. Being open, encouraging and diplomatic as a team member will help ensure that your group thrives on the whole. Different people might need different things from being a part of your team, and if you all want to get better grades with teamwork, this will have to be accounted for. Everybody in your team should get their turn to speak, make their points and engage in helpful debate. Some individuals may need some encouragement to proffer their thoughts, but they should be given this support by the rest of their team. By, as a group, remaining open to suggestions, and encouraging one another to put their ideas forward, you stand a great chance of discovering new ways and techniques of learning and studying effectively. Finally, should any disagreements arise, remaining diplomatic is the best, and only, way to deal with it. If you, and the rest of your team members, follow these guidelines you give yourselves the best chance of getting better grades with teamwork. If you haven’t used teamwork as a revision and/or studying technique before then now really is the time. It doesn’t have to be just with your fellow students either. Your parents/guardians and teachers are already on your team as they want you to get the best grades you can. Ask for their help and make sure you don’t forget that they’re your teammates too.